Why Is There a Big Rig Truck Shortage? Shippers who want to grow their fleet are in for a rude awakening when they go to order new trucks. Currently, the backlog for big rig orders is longer than it’s been in more than a decade — with little indication that demand will slow or supply will increase anytime soon. As of this writing, most new orders will not be delivered for nearly a year. A recent report from the Wall Street Journal found that “an unprecedented run of orders for big rigs has pushed the backlog at truck factories to nine months.” Typically, the backlog for truck manufacturers hovers around five months, which means current lead time is nearly twice as long as average. The last time a backlog like this occurred was in early 2006, when truckers stocked up to buy vehicles before tougher environmental restrictions were put in place. Back then, orders for class 8 trucks topped out around 375,000 in the first five months of the year. Our current buying rush is more than 475,000 orders strong in the same period, according to WSJ. In July alone, North American fleets ordered 52,000 trucks — an all-time record. Analysts have pointed to several factors that are driving the backlog, including increased demand and problems in parts fulfillment. E-commerce is turbocharging demand for shipping, and the truck manufacturing industry is having difficulty keeping up. Spot market rates, which can serve as a key indicator for shipping demand, have been hot throughout the summer. 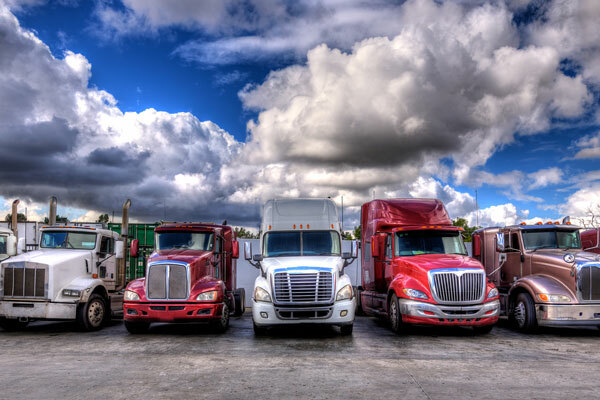 In the early summer, Truckstop.com reported regularly seeing double the average number of loads posted on its system. Some of this demand for spot rates has dwindled, but it remains very high compared to previous years. The growing popularity of online shopping for large items like furniture and appliances will likely continue to add pressure to this shortage, especially among last-mile shippers. The shortage of trucks comes at a time when finding drivers is difficult as well. A debilitating driver shortage has hindered growth for many shippers. As a result, a number of companies are putting in orders for new trucks to attract driver talent with updated gear and amenities — increasing the demand for new vehicles even more. In addition, many shippers are looking to purchase more energy-efficient trucks in order to cut overhead on fuel and meet growing consumer demand for environmentally conscious solutions. Ironically, much of the shortage of new trucks can be pinned on issues in the supply chain. Earlier this year, overseas factories had a difficult time fulfilling orders for truck parts. Because you can’t complete a truck without every hose, screw, and light bulb firmly in place, a mix-up with one key distributor can bring the whole assembly process to a halt. The problem is magnified when multiple manufacturers use the same key suppliers. Delays in deliveries from these suppliers created a ripple effect that slowed production across the industry. Currently, companies are increasing production to get on top of existing orders. Only time will tell how successful their efforts will be. For many businesses, trucking could become an achilles heel in the supply chain. The combination of driver shortages paired with long waits on new equipment may lead to a costly and difficult holiday season for retailers and others. One way to prevent major issues is to team up with established shipping partners who have the existing infrastructure to keep up with demand. Port solutions leaders like Globecon also offer portside warehousing to ensure you have consistent stock available when you need it. Learn more about Globecon’s drayage, trucking, and warehousing solutions. Contact us today!